AcclaimIP can store custom data in fields called "Custom Data Fields." One or more person at your company or organization has rights to create, modify and delete custom fields, but normal users will have either the ability to read them, read and write to them, or not view them at all. Your administrator will assign access privileges to custom fields. Custom Data Fields store all normal data types including. Boolean Fields: Boolean fields hold values True or False only. The are used for tagging patents with simple yes or no answers such as "Claim Charts Available:T"
String Fields: String fields hold text such as comments, descriptions or URLs. Multi-Select Combo Fields: Multi-Select fields let you choose one or more values pre-defined by your administrator, such as those used in a corporate taxonomy. Tag Fields: Tag fields enable users to tag patents with free-form labels and tags. Date Fields: Date fields only accept date values and ensure that dates are entered in the correct format. Date Fields are commonly used for a CPA Expiration Date if you use CPA as your annuities vendor. Custom Fields are found in the Search Result window where they are sortable, filterable, facetable and searchable. 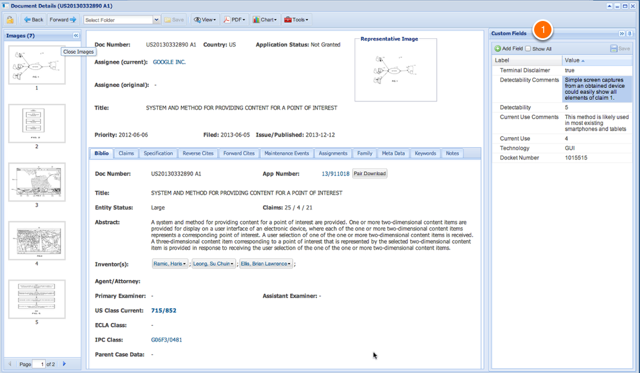 They are also found in the Document Details window where users can view and edit them. Your administrator has the ability to upload data in bulk to custom fields. Filters based on custom fields can be invoked by clicking the Custom Facets button (1) and picking which custom filters you would like to view in your user interface. Custom filters appears in orange color (2) on top of the default filters in AcclaimIP. The custom filters are faceted (3) (notice the counts). Sortable custom field columns (4) also have an orange background. Custom field data is sortable, and exportable from the Search Result window. If custom fields are enabled in your account, you will see an accordion-style panel, which can be opened or closed, on the right side of your Document Details window (1). Custom Fields can be edited directly by double-clicking in the Value field and editing as appropriate for that field's definition. When your administrator creates a custom field, he or she will also assign it a field code, which is the short code you use to query your custom data. You should already be familiar with field codes. For example, TTL is the Title field; to find patents with "endoscope" in their title you type TTL:endoscope into Quick Search. Custom fields are just a little different. Custom field codes always begin with the underscore character. In the example above, the administrator created a field called TAX.TECH and AcclaimIP automatically added the leading underscore (1). AcclaimIP adds the underscore character to avoid collisions with the hundred or so existing patent data fields. For ease of use, field codes should be short acronyms that identify the field. In this example I used the abbreviation TECH for "Technology" when I created the field. The field is further organized in a folder called "Taxonomies" which I abbreviated, TAX. Therefore the field code is _TAX.TECH. _TAX.TECH:"Speech Recognition" --> Returns patents that have been tagged with "Speech Recognition" in their _TAX.TECH custom field. _ABD:T (While not as descriptive, custom fields codes are mapped to a descriptive Field Title and a descriptive Tooltip to clarify them for you in the user interface).